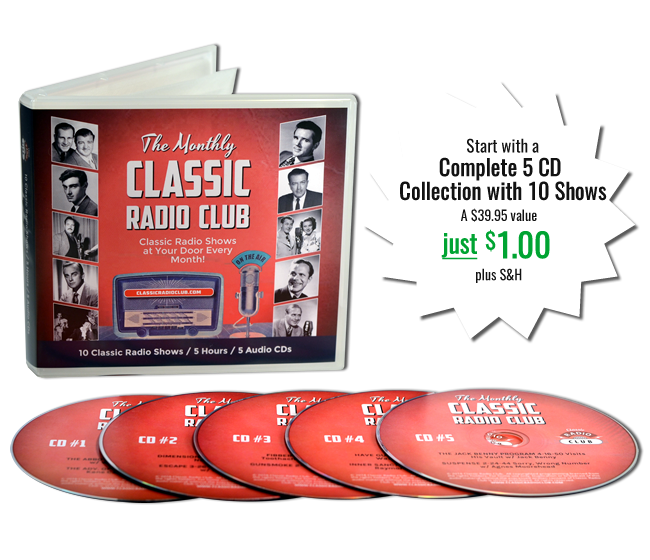 Join now and receive 10 Classic Radio Shows on 5 CDs for just $1.00 (plus $4.99 S&H) for the first month. After that, you will be sent 10 different shows each month and automatically be charged $14.99 plus $4.99 s&h. Join now and receive 10 Classic Radio Shows on 5 CDs. After that, you will be sent 10 different shows each month and automatically be charged every 6 months. You can cancel your renewal at any time. Join now and receive 10 Classic Radio Shows on 5 CDs. After that, you will be sent 10 different shows each month and automatically be charged every 12 months. You can cancel your renewal at any time.